ZIMBABWE – Sniping around these topics highlights the intensifying battles in Zimbabwe’s faction-ridden ruling party over who will succeed President Robert Mugabe, in power for 36 years. Mugabe, the world’s oldest head of state, recently warned officials of his ZANU-PF party to stop insulting each other. A lot of the bitter quarrels, which come ahead of Mugabe’s 92nd birthday on Feb. 21, happen on Twitter and other social media platforms, providing Zimbabweans with a stream of nasty, colorful and sometimes entertaining quips that would have been unthinkable not long ago. None of Mugabe’s current close allies has challenged his rule, which began with independence from white rule in 1980 and has been marked by economic hardship and contentious relations with the West. The disputes within the ruling party are the result of Mugabe’s failure to groom an obvious successor, said Gabriel Shumba, a human rights lawyer and chairman of the South Africa-based Zimbabwe Exiles Forum. “It has become so heated because Mugabe has deliberately kept the lid on the discussion,” Shumba said. On Thursday, police used tear gas and water cannons to disperse hundreds of military veterans who were demonstrating in Harare, the capital. The veterans were upset with what they described as criticism by Grace Mugabe, Mugabe’s wife and a prominent member of a political faction. In a new challenge to Mugabe, his former vice president, Joice Mujuru, this month registered a rival political party and plans to run for president in elections scheduled for 2018. Mujuru was fired from her position in December 2014 after 10 years as Mugabe’s deputy for allegedly plotting to unseat the veteran ruler, accusations she denied. The 60-year-old then formed her own movement called Zimbabwe People First. A key figure in succession talk is Vice President Emmerson Mnangagwa, who is also justice minister and a veteran associate of Mugabe dating to the guerrilla war against minority rule in what was then Rhodesia. He is widely known in Zimbabwe as “the Crocodile” because he was a member of a guerrilla group with that name. His supporters have begun identifying themselves as Team Lacoste, because the French designer label has a crocodile logo. Then there is “G40,” short for Generation 40, a group that is associated with Grace Mugabe, who has raised her political profile. Higher Education Minister Jonathan Moyo coined the “G40” term, which refers to young ruling party members vying for leadership opportunities. 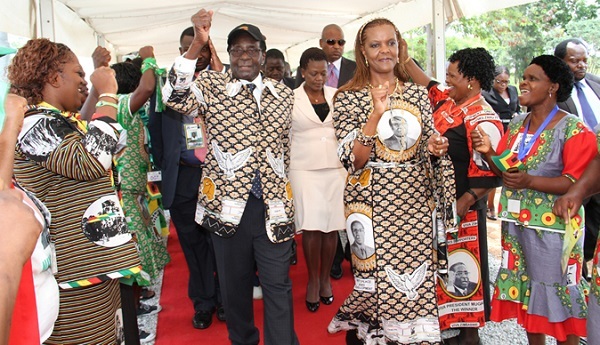 Grace Mugabe tore into Mnangagwa’s faction last week. “I don’t lose sleep over being labelled G40,” said the first lady in the local Shona language at a rural rally on Friday. She criticized party youths wearing Lacoste labels and said political rivals were out to kill her family. A recent back-and-forth string of thieving allegations between Moyo and Chris Mutsvangwa, the minister of war veterans who is close to Mnangagwa, has grabbed the attention of many Zimbabweans. Mutsvangwa denied the allegations and fought back by accusing Moyo of stealing radios from a benefactor during the war and of eventually deserting the 1970s struggle because of a factional dispute. Mutsvangwa also described Moyo as a “Rasputin” figure — an apparent reference to his links to Grace Mugabe — and has said Moyo should take a DNA test to prove he does not come from a bloodline hostile to Mugabe.